One of the great thrills of visiting India is realizing how much is still made by hand and on the spot, from jewelry to rugs to furniture. But if merely watching an artisan create a made-to-order shawl isn’t enough, one company offers travelers the chance to do it themselves. 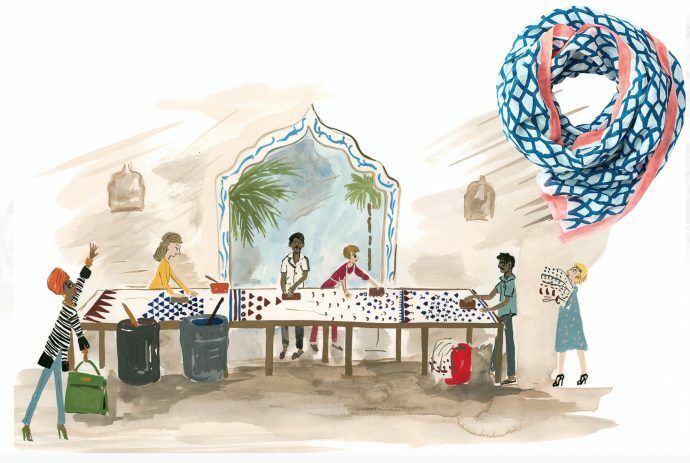 India Beat, owned by Bertie and Victoria Dyer, a husband-and-wife team of trip-planners, facilitates half-day workshops in hand-block-printing in Bagru, a village outside Jaipur. The couple works with a single family of artisans who have been practicing their craft for generations and who help guests choose a design (whether traditional or newfangled) and color scheme (brick reds and deep indigos are popular picks). After practicing on a cotton prototype, the printmakers-in-training stamp their final designs onto a piece of cotton-silk cloth using custom-carved wooden blocks. The hope is that, in addition to a unique souvenir, people leave with a deeper connection to the country’s material culture. For all its glorious chaos, Victoria says, “India remains a place where intimate moments are still the most special.” From $175.